On a cold February afternoon two representatives of CCC attended a cycle safety audit of the roads around St. Pancras Station. The main problem on Pancras Road is the very narrow space cyclists have to use to pass the taxi rank (as shown in the photo on the right). 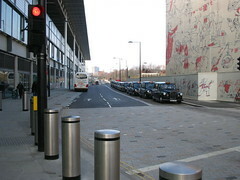 Some other vehicles choose to pass the taxis here (on the wrong side as shown in the photo)! 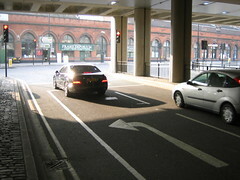 It was decided that it would be best to move the centre line more towards the middle and thereby give cyclists more space to pass the taxis. 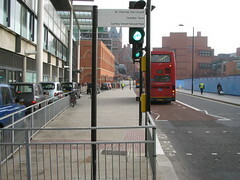 The same problem occurs further up Pancras Road (photo facing north from main entrance to St Pancras International) and can be similarly resolved, with northbound traffic put in one lane. Moving up to the junction with Goodsway, we noticed taxis trying to squeeze in an extra lane to turn left into Pancras Road, and blocking the ASL feeder lane (photo facing east along Goodsway). 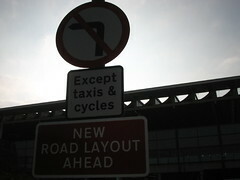 Only taxis and cycles are allowed to travel down Pancras Road at this point, but the signage is not particularly clear. Cyclists coming south from Camley Street are still vulnerable to being hit by left-turning traffic. The ASL is to be reinstated, but it is not clear how best to enable cyclists to get through the junction. An inside feeder lane to the ASL is no good, but an outside feeder lane not much better. One suggestions was to create two traffic lanes, one for left-turning traffic, one for right-turning traffic, which should at least make it clearer to cyclists which way motorists were going to turn. The difficulty with this idea would be deciding upon which lane cyclists should use to go straight ahead down Pancras Road. The next major issue is the difficulty cyclists face trying to turn right where Goodsway meets Midland Road (photo on the right). It was agreed that the best thing would be to remove most of the inside cycle lane (leaving it for the first 20m or so from the Pancras Road junction), put in a ‘gate’ entrance to the ASL and put in an “except cyclists” sign by the left-turn only arrow in the inside lane. 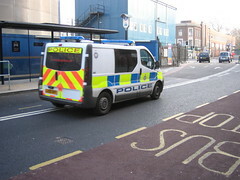 Turning left into Midland Road, there was general agreement that there was sufficient space to allow contraflow cycling. 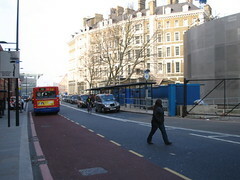 One idea was to revert to two-way working, by taking out the bus lane and putting putting the bus stops inside the large paved area between the carriageway and the taxi ranks (photo on right). 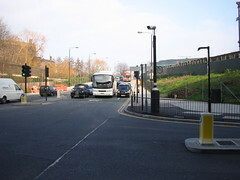 At the junction of Midland Road and Euston Road, it was noted that there is just about enough time with the current traffic signal phasing to enable cyclists to access Midland Road northbound. We look forward to seeing the conclusions of this safety audit and for rapid implementation of measures to improve conditions for cyclists.